Check why members wanted to signin to this group. - GGI-Group size: 4000+ Professionals, Increasing on day to day basis, Come & join us 2 serve Mother Nature. I have a LA-Sovereign Spectrum Cycle, and I cycle to work. I am looking at upgrading to a Road Bike. I am software engineer working at Honeywell(age 24). Currently i own Hercules Atom. I decided to go on Cycling because it makes me fit & healthy and also allows me to enjoy watching city when moving in slower pace." Hi, I Am working in Accenture and have been in Bangalore for around 5 months. Bought a bicycle around 1 month back, for fitness purpose. I like exploring new places and find cycling one of the best means to do so. "Cool person who always believe in ""Be Simple Be a Sample"".Presently working as a Software Engineer. Was using cycle from my 1st standard till my Engineering. But after joining the job i no more use any cycle, always on my bike. I think cycling helps all the organs of the body to be fit and a long life." "I just started cycling, well you can say i learnt to cycle like a few months back. I am still getting a hang of it. I am 29 years old. I bought a Firefox zoom 3 months back.I Love cycling. I am tired of looking at vehicles poluting this city its very sad. I am also a member of a small initiative at work ""No Plastic"". At work we have plastic plates for meals. A few of us at work get our own plates and mugs as we don't want to use plastic plates and plastic glasses or paper cups. I would like to contribute more to the Go Green cause." "2009 Bianchi Aeron Sport, 2007 Rocky Mountain ETSX 10"
"I am Prem Sagar, 29 years young and married. I pretend to work in a software firm as a technical lead. I own a Trek 4300. I love cycling.. thats why I picked it up again after 12 years. The other benefits are just a bonus. I go on regular weekend trips for bird watching to places around Bangalore.. and as often as I can, I intend to replace the car with the cycle. " "I am 23. Presently working for TCS in design and development of Orthopedic implants. Hobbies include Karnatic music(listening), books(novels) and puzzle solving. Decided to go cycling for physical excersice." I really want to contribute towards environment and Bangalore traffic problem. At the same time I see clear opportunity of work-out in regular cycling. I have been cycling for past 3 years, only reason to do so is to be fit and young. Im a software professional, 33 years old, likes to chase all my dreams, and cycling is a dream that occured to me about a month back while buying a kiddie bike for my 4 year old. 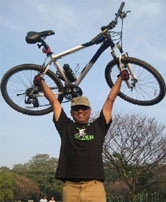 And here I am with a brand new Merida 40D, and cycling 10-12 kms daily, and going off for 50+ km rides during weekends. Although the official reason is that I'd like to burn some fat, and save on fuel! I work as a GM HR for Columbia Asia Hospitals Pvt Ltd., I have a fire fox cycle. "Typical sports fanatic,loves to play cricket,football, shuttle badminton. Was member of Koramangala Cricket Club back in 2003. Current passion is running, cycling and swimming. Daily runs for 5kms in half an hour. Started to use bicycle during dec 2008, just to try out how much it ""cuts"" my daily travel time from home to office. The distance one way is around 22kms. Borrowed one ordinary cycle (hercules MTB) from one of my colleagues and started the ride. To my surprise, it cut down the travelling time from 3.5 hours (in BMTC bus) to 3hoursflat. two way. So bought a hero ranger (without gear doens wanted to shell out much moolah) couple of months back. Would like to have a sports cycle also, if somebody wants to sell a second hand one let me posted." I am software professional and like cycling to keep good health and state of mind. I own a hero ranger bike with 6 gears. I work as Technical Consultant in MNC. I used to cycle a lot in my hometown for 15 years. Then paused for about 8 years to due to other prorities. Now back in track, I enjoy it because I do not know how to ride motor bikes or car. With the weather and slope of Bangalore it is pleasure to roam around and find new places which you cannot cover by walking. Join Cycling - you will definitly enjoy. Anand Yadwad (Victoria Layout Behind Lifestyle) I am 37 years old & am working with Arvind Brands as a Product Head handling Flying Machine & US Polo Assn.. have not bought a cycle as of now , but will buy one beginning next month. Cycling will keep me fit to a certain extent ; help me save some money being wasted on petrol presently & my little contribution to the environment. Jennifer J Grant,(115 Habourreef Dr.) I am striving to create a healthier living group for families and community by incorporating outdoor biking! It's a great family activity that can be enjoyed regardless of your age. Promoting healthy habits from a young age and promoting family unity is what we strive to do. So join us by making yourself and your family healthier while enjoying the communication with others that are also striving to live a healthier life. Save our planet and Go Green by Growing Lean...Just Bike It! Vasant Kumar, (hockey stadium Richmond Rd.) "Buisnessman running a packaging unit in Bommasandra Hosur Road 46 yrs old, Mechanical Engineer, Hercules DX MTB ,Eco friendly,Very good form of Exercise,Takes you places in goodtime ,Can avoid Traffic snarls Save natural resources Save Mother Earth"
Nanjundappa Nisarga,(704,Sector-1,HSR Layout) "I am a bicycle enthusiast married with two daughters. I ride a Hero Thunder MTB 21 speed .I want to travel and enjoy scenic places around Bangalore.I think it is best way to tackle global warming. I vision of Go Green. I have been into serious motorcycle traveling. Now it is an opportunity to ride bicycle with purpose with you people. RenuKumar, (JP Nagara 7th Phase) 26 years old, working for HSBC in Bannerghatta Road. I am a nature admirer. I burn a lot of fuel as I am into motorsports. Cycle is one of the best tools to cover the guilt of burning fuel. I commute to office regularly on my cycle and I have succeeded in saving several litres of fuel. I use Atlas Totem. It is MTB type senior sports bike with front and rear suspension, shimano gear and adjustable handlebar position. This is Kamath, Working in Investment banking, Im an Adventure freak.. till this time i was totally interested in trekking, exploring all the mountains and rivers in Karnataka.. Now i have purchased an imported bike Rockrider 5.3 MTB just few days back.. I have decided to go on cycling to prevent pollution and also to promote cycling to younger generation. Mohan kumar C S,(Moodalapalya) young and energetic chap. Loves adventure. I work for a BPO Co. I own a brand new cycle 'Rockrider 5.3'(Decathlon product) with disk brakes option. I like to be fit and want to give back the society good environment to live-in. Cheers !!! aged 27, I work for Ciber as a Sr. Consultant. My cycle model is Hero Hawk. To have pollution free Bangalore and to do some physical workout. Working with Convergys Corporation for the past 6 yrs. Into Business Development (for NA clients - so night shifts) . Celebrated my 27 birthday a few days ago. Own a Hero Hawk. Usual tour on Sunday mornings. Main purpose is to give my body some workout. Walk to office. If I cycle i gotto take a bath in office :-). Usually take a tour alone (my companion just got married - and you know, bonded then). I have seen you guys assembling at Marannahalli Jn (JPN) in the mornings. Thats the time I come back from my rides from MG road. Dont like to wear a helmet. On cycle you will find me with an mp3 player. Trance music peps me up! I am Kathyayini, an Architect by profession hailing from Chennai,currently settled down in Bangalore with my family. Since we had past history of working here in Bangalore, it has never been a new place for us. My Husband is in the Telecom Industry. Cycling was one of the key activities during our childhood and both of us have a sports background. But somehow we never looked cycling beyond our school days. But I think people have gained tremendous knowledge and awareness about the global warming and its impact on our survival in whatever field they might be in. And this only shows every industry is contributing to this global crisis. too want to contribute in a small way in my day to day life and be more energy conscious. A long way to go…but am more positive in accomplishing it. aged 18,m doing 2nd year BBM in dayanand sagar .i personally believe that we owe a lot to mother earth,and its our responsibility to protect it. i have always wanted 2 be a part of one such club, i also tried 2 form a eco club in our college but was was not a lot of my friends made fun of my thought and had no support from my friends. i was very n was look ing for one such club. am also very excited to meet the other members ... a change can be bought only when our mind set changes, and i have decided to bring a change .. I am a techie working for IBM. 26 yrs old , an athlete, own a normal gear-less Hercules bike. I used to cycle to School, Tuition, Engineering College & even Abroad. 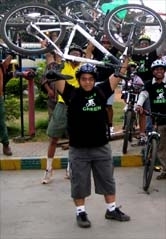 But since I came back to Bangalore, I cud not pursue it.. Go green brought me back to Cycling! Jai Ho! I moved in Bangalore few months ago. I really like Bangalore's weather compared to Delhi where I was living past few years. I work at ANZ, Manayta Embassy park. I bought a Hercules city bike but after some time my enthusiasm has died down so I'd like to join you guys to get back to cycling. Hi, I am an exercise freak but due injuries from early Jan 09 I started cycling to loose weight and I am thoroughly enjoying every ride..I also took part in the recent BSA Duathlon and sucessfully completed it. I would be shortly starting to travel to office on my bicycle, as of now slowly practising the distance from the past few weeks. I work as a Quality & Training Officer in Amicorp Management India Pvt.Ltd. I ride a Hero DTB (6 Gears). 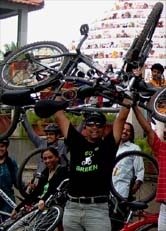 The reason I have started cycling is to keep myself fit and also to contribute towards reducing Global Warming..